If you’re heading to Sydney and are looking for a hotel stay that’s in the heart of the city and a little out of the ordinary (in a good way, of course), book a room at the retro-inspired QT Sydney! Located on Market Street in Sydney’s CBD, QT Sydney is a great starting place for exploring the city’s shopping and cultural scenes as well as world famous landmarks such as the Sydney Opera House and the Sydney Harbour Bridge. 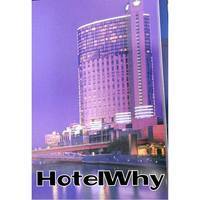 Close to public transport, the hotel is easy to get to regardless of if you’ve caught a flight to Sydney or are heading into the city from the suburbs. Built within the historic State Theatre and Gowings Building, the hotel also houses a day spa, a barber shop and several eateries that will have you wanting to spend the day relaxing in-house. 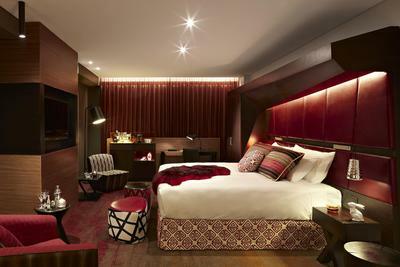 QT Sydney’s 200 luxurious rooms are decorated with a mix of elements drawn from Gothic, Art Deco, Italianate and modern architecture and design, giving the hotel its own quirky look. 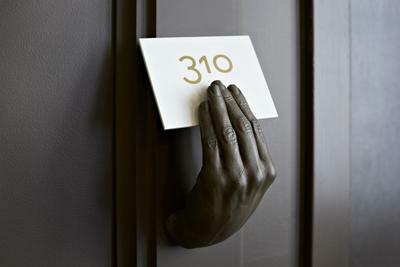 From indulgent oversized bathtubs to brass hand-shaped room number holders, no detail has been forgotten! Address: 49 Market Street, Sydney.